Mario Kart 8 (マリオカート8, Mario Kāto Eito?) is a kart racing game developed and published by Nintendo for the Wii U. It is the eighth and latest installment in the Mario Kart series, and the eleventh overall. It was released worldwide in late May 2014, with 1.2 million copies sold in its first four days, making it the fastest selling Wii U game to date. At E3 2014, it was announced that at some point in the future some titles, including Mario Kart 8, will have support for Nintendo's upcoming Amiibo line of figurines. 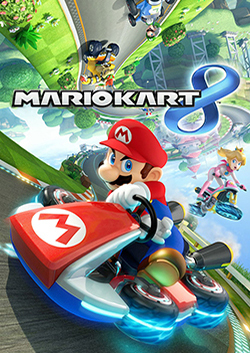 An updated version titled Mario Kart 8 Deluxe was released in April 2017 for the Nintendo Switch. This version includes all the DLC and adds new characters, the ability to hold two items at once, and an upgraded Battle mode. This page was last edited on 7 February 2018, at 20:12.